Master Clewin, left, and Don Jacob, right. Here is some news that may interest fighters and fencers: there is a new holder of the Sylvan Bronze Crescent! 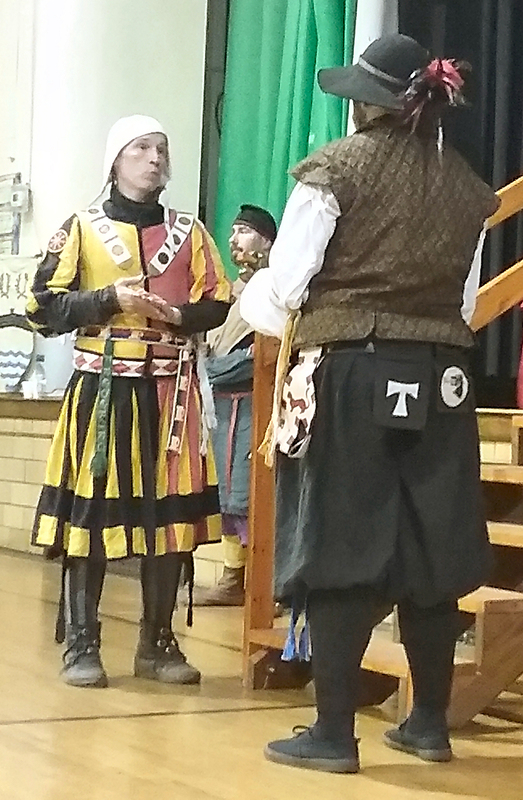 At the first Æthelmearc Grand Tournament, held in the Barony Marche of the Debatable Lands, Don Jacob Martinson was victorious and now holds the cut and thrust fighting prize known as the Bronze Crescent. Great job! For those who do not know, the Bronze Crescent is a meritocratic challenge prize in which a challenger must defeat the holder in cut and thrust combat to claim it. It is open to all authorized cut and thrust fighters of Æthelmearc. Please direct your challenges to him, per the rules. Not familiar with cut and thrust? You can check aerapier.org for all the details!